Previously on “Andrew takes a piece of pop culture and over-analyzes it to death“: we went to Rapture, the city under the sea in Bioshock and Bioshock 2 (and, briefly, Bioshock Infinite) to figure out exactly where and how deep the city was. In the end, I came up with a respectable if underwhelming, maximum depth of 150 meters. Deep, but not crush-your-sub, deep. And then I played Bioshock Infinite: Burial at Sea 2 and Glomar Challenger, we have a problem. In Burial at Sea and Burial at Sea 2, we return to Rapture, but this time to the de facto prison of Frank Fontaine, now cast out of Rapture and sunk into the trench, deeper than the city, but just how deep? Wandering through the claustrophobic hallways, we catch the occasional and unmistakable glimpse of an anglerfish, Melanocetus johnsonii, the humpback anglerfish. These are iconic deep-sea animals (though they’re most notorious feature is not entirely accurate). These creatures are commonly found in 2,000 meters of water. That’s a bit more than the 150 meters I determined. Fortunately, the problem isn’t nearly as convoluted as all that, and has the added advantage of now not only telling us how deep Rapture is, but also give us the time of day during which Burial at Sea takes place. Humpback anglerfish spend most of their time at depth but, like many marine predators, they follow the great diel vertical migration to feed. At night, they rise to near the surface to capture abundant prey. 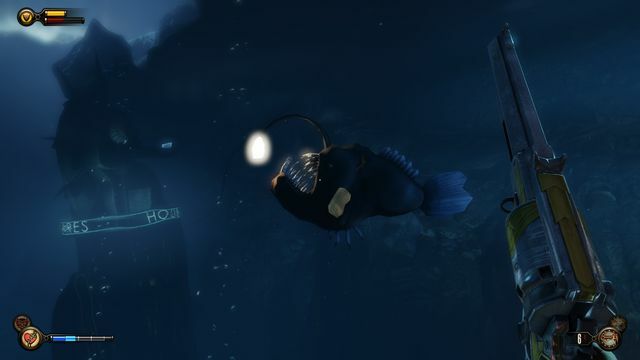 Humpback anglerfish have been caught in water as shallow as 100 meters, well within Rapture’s limits. At one point, Frank Fontaine declares that they’ve been dropped 5000 fathoms down. We know this to be a lie because A) Frank Fontaine is a liar and B) 5000 fathoms is over 9000 meters. That’s not only deeper than any point in the Atlantic, that’s deeper than the deepest fish ever found. So, despite a few oddities in Burial at Sea, Rapture is still only in about 150 meters of water and we now know that the events featured in this Bioshock epilogue happen at night (or, at least night on the surface). Until next time, I am Andrew, ruiner of all fun.